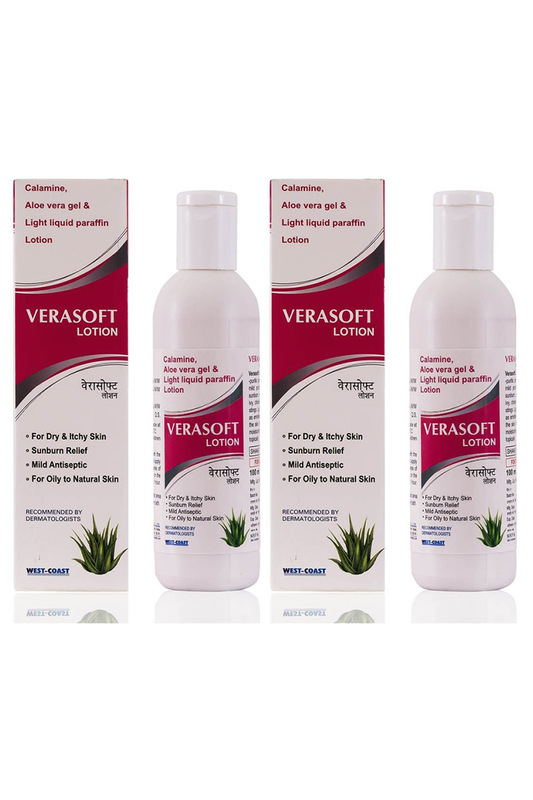 For Dry & Itchy Skin Sunburn Relief Mild Antiseptic For Oily To Natural Skin Verasoft Lotion Is Used As Anti-Pruritic Anti-Itching Agent To Treat Mild Pruritic Condition Such As Sunburn, Eczema, Rashes, Poison Ivy, Chicken Pox, Insect Bites And Stings. Light Liquid Paraffin Is Used As Emollient To Prevent Dryness Of The Skin. Aloe Vera Gel Also Have Moisturizing Effect When Applied Topically. Storage Store In A Cool & Dry Place At A Temperature Below 300C. Keep Out Of Reach Of Children. How To Use Moisten A Wad Of Cotton With The Lotion And Use The Cotton To Apply The Lotion To The Affected Area Of Skin. Allow The Lotion To Dry On The Skin. Onset Of Action Within 1 Hour.